CodeTwo Backup update 1.3 – New UI! CodeTwo Backup update 1.3 – New enhanced UI! Our CodeTwo solutions for performing backups, restore jobs and keeping mailbox data on local drives, have just been upgraded to the version 1.3. CodeTwo Backup for Office 365 and CodeTwo Backup for Exchange gained new UI features which boosted up the programs’ functionalities and eased administrator’s work with a few improvements. CodeTwo developers added two alert windows to the program’s dashboard. Good news and Bad news windows inform you about key events included in the on-going backup or restore jobs. 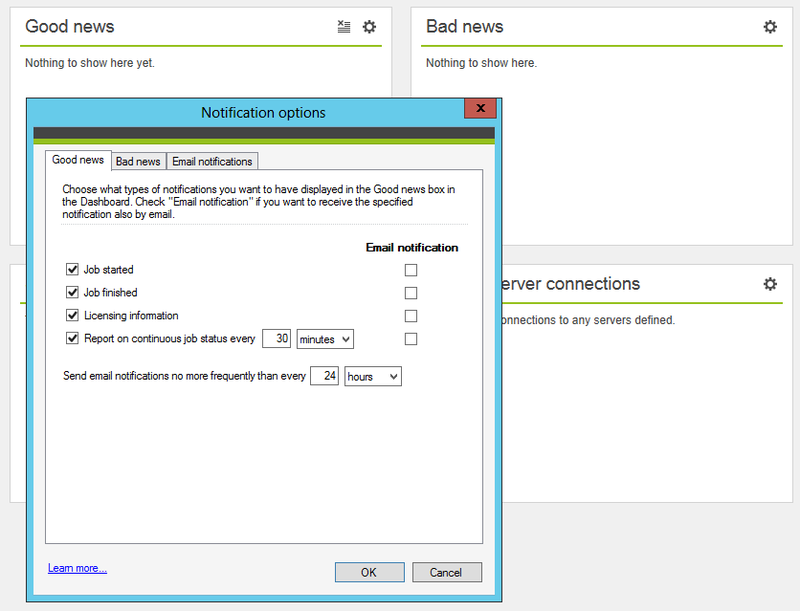 Now you can also keep yourself updated with good and bad news notifications automatically sent by the program to a specified email address. Moreover, some of the minor improvements to Backups time-filter and restore options will make now your admin’s tasks easier. To see a full list of changes, please visit the version history sites for CodeTwo Backup for Office 365 and CodeTwo Backup for Exchange. The newest version is free of charge for all license owners.